Most people like spending time out in the sun, especially at the beach. Sometimes it can get a bit too much though and you need to have a break to cool down and protect your skin. In order to do so, you want to get the best beach canopy possible. In order to get the best beach shade for you, there are some key features that need to be taken into account. This includes the size of the canopy and other important areas such as wind protection, how it’s set-up and the UV rating, among many other factors. In order to make it as easy as possible for you, we have created a buying guide to explain all of those key features and have also completed beach canopy reviews to show you the best products on the market. Once you have finished reading this, you’ll know exactly what you need. Neso have been able to produce this brilliant sunshade that is going to be able to protect you when you are out there on the sand. It comes in a very easy to carry bag, allowing you to easily take it to where you need that shade. It is made from high-quality materials that are going to be able to last for a very long time and the aluminum poles are also going to be resistant to rust. The poles are well anchored into the sand, giving you the confidence to relax in the shade. This is a high canopy that is going to be able to give you a good amount of shade. The set-up of the canopy is going to be very easy, allowing you to get it erected in no time and allowing you to spend more time in the shade. There are a few different design options available and the canopy is kept flush to the ground with the sand pockets that it has. The internal pole will make sure that it stays upright and the double canopy is going to be able to give it a good level of wind resistance. Crown Shades have been able to produce this top rated beach shade that is going to be able to give you excellent protection from the sun. It is large in size but it is still easy to carry and set-up can take one person less than a minute to complete. The fame is made from high-quality steel that has been coated to prevent any chipping but to also prevent any corrosion. It’s made of the best materials available and is also going to be able to give you a full level of protection. 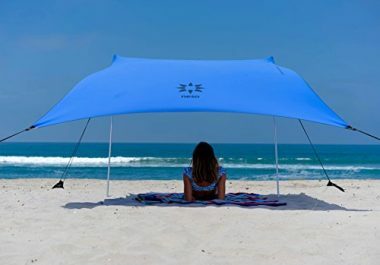 This brilliant canopy for beach is another great product from Neso that is going to be able to give you the protection that you are looking for. It has a stylish design and gives you everything you need for a comfortable day at the beach. 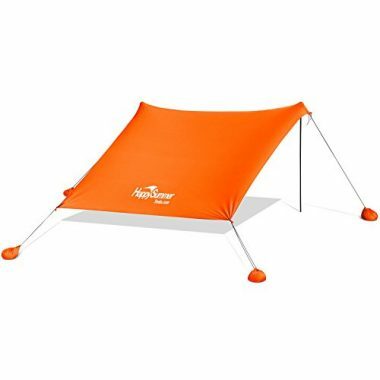 One of the best features about this canopy is that it only weighs 6.5 inches making it incredibly portable which is aided by the easy to carry bag that it has. It gives you full sun and rain protection to ensure your day at the beach is as good as possible. 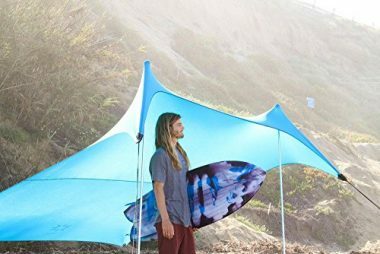 This beach shade canopy from Quik is another excellent product. One aspect that separates it from many other types of canopy is that it has a shade on the back in order to give you for protection when the sun is a bit lower in the sky. It has a sturdy design but the construction is able to remain lightweight and easy to construct. It comes in an easy to use backpack that is going to make it highly portable. It is made of high-quality material that makes it highly durable. This is a large beach canopy but one that will only take two minutes to set-up, making it a highly convenient canopy to use. 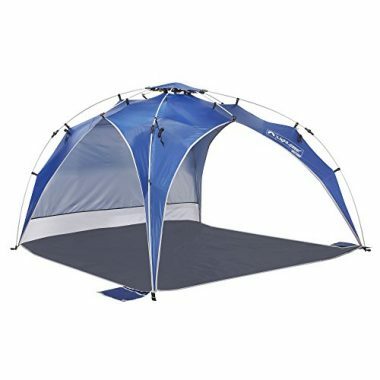 It has fully taped seams for the greatest level of weather protection and a double canopy that will give it a high level of wind resistance. 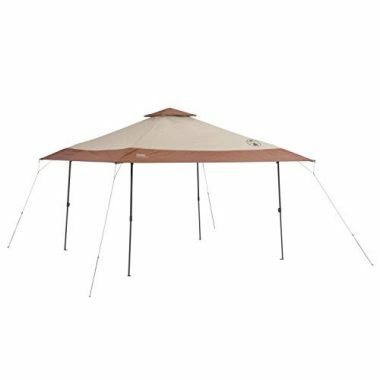 It has a heavy-duty polyester canopy and steel frames that are going to be able to give the whole product a very large amount of durability. The canopy is highly versatile and can be used in a wide variety of different tasks. 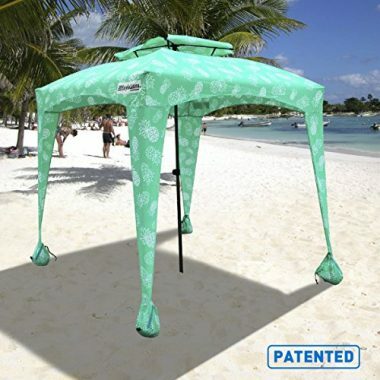 This is one of the best sun canopies for beach that are out there and has a very easy set-up, allowing you to quickly be able to enjoy the sun. It should only take around three minutes, which is a great time given the overall size of the canopy. It is able to offer you the highest level of sun protection to guard against those UV rays and the whole product comes in a wheeled carry bag to ensure that it is highly portable. Overall this is a great product that is going to be ideal for a wide range of people. 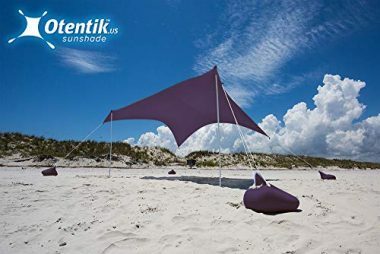 Otentik have been able to produce this brilliant beach sunshade which is highly-rated by those who have used it with a long list of great reviews. It uses sand to anchor it to the ground and will be able to give you a very stable canopy. The product is also available in a very wide range of different colors to allow you to add a bit of personality to your canopy. It’s available in different sizes depending on your needs and gives you a brilliant level of sun protection. HappySummer have been able to produce this highly wind resistant beach canopy that has a simple design but with a high level of effectiveness. It comes in two different size options allowing you to get a product that suits your needs. There are also a bright range of colors too which all look great. A high level of UV protection is offered to ensure that you are given the shade that you are looking for. It’s a weatherproof product that is going to give you a high level of durability. If you’re looking for a pop-up beach canopy then this could be the perfect product for you. It comes in the shape of a tent and has a floor that is going to be able to protect you from the ground and also any hot sand. 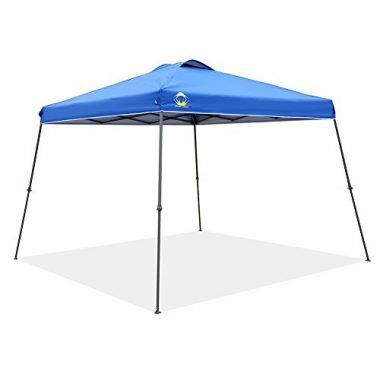 It is easy to put up and has a high level of sun protection with a UPF 50+ rating. The canopy is also lightweight too and able to be easily transferred from one place to another. It has a sidewall that is going to be able to give you even more protection from the sun and the wind. There are a few different types of beach canopy available, allowing you to be able to choose whichever one is going to best fit your circumstances. There are the traditional types, tarps and ones that are also enclosed. The traditional types are the ones that have the sturdy metal from and are going to be able to give you a good amount of stability with a lot of internal space so that you’re not too restricted, these are great for large groups and are ideal for the beach. For those looking for a simpler solution, tarp canopies can be ideal as they are much lower to the ground and generally work from four different poles rather than having a complete internal frame. 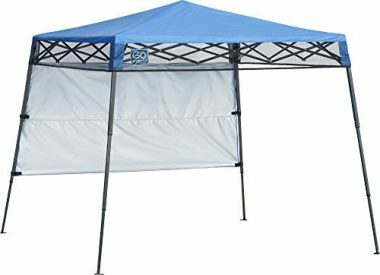 These give you less space but a good amount of shade and they are also very light and portable. The enclosed type of canopy is one that takes on a similar look to a traditional tent with a floor and a lot more fabric. These can be ideal for those looking for more ground coverage but are generally heavier and also harder to set-up. The size is obviously going to be a key factor when it comes to the type of canopy that you are going to be able to get. This is going to largely depend on the number of people that you intend to be having shade under the canopy. There are other things to take into account here though such as the type of beach you are on. If you are aiming to go on a particularly busy beach then there might not be enough room to be able to put up a large canopy. It could also be that you want a base to place your items and don’t need to accommodate everyone at the same time. All you need to do is assess your own needs and get a canopy that is going to be able to match what you require. It’s important when looking at beach canopies to get a material that is going to be able to have a high level of durability. Any rip in the material is going to reduce its effectiveness and therefore it negates the reason that you decide to get the product in the first place. UV rays can not only damage your skin but they can also damage materials too and having a high level of UV resistance is not only important to protect yourself but it is also important to ensure that your canopy is going to last you for a very long time. Most of these products are made with thick and durable material, and all of them have a very high level of UV protection. Whenever you buy anything that is meant to shade you, it’s good to know exactly what protection you will be getting. Wind is always going to be stronger on the coast which means that any canopy that you have is going to need a high level of protection against the wind. This is going to be done in two ways by either a double canopy or having the legs fixed to the ground. A double canopy is where there are two layers of coverage that overlap each other. Not only does this allow the circulation of air but it means that wind pressure doesn’t build up inside of the canopy and blow it away across the beach, this is especially important in large traditional canopies. The other way is having the canopy securely fixed to the ground. This will either be done with guy lines, stakes or sandbags. All these methods can be highly effective and you want to make sure you are fully protected from the wind. There are a few different design options that you can have when it comes to the legs of these canopies as they will either have a slant leg design or they will go straight up with the traditional type of look that you most often see. There aren’t really any great advantages to the slant leg design other than the fact that many people feel as though they are more visually appealing. You also need to consider that is increases the area of the space you are using beyond the canopy. The straight leg design is the much more common type as this is the tried and trusted method. It might not be the most aesthetically pleasing design type but it is going to take up less space and is also going to be very sturdy too. The material that can be used in these beach canopies can’t be very flammable due to the type of activities that can often be associated with the beach. Many people love bringing a portable grill to the beach or setting up their own campfire. This can mean that embers or sparks could fly away and come into contact with your canopy. If this happens, you want to be confident that it’s not going to damage it or even worse, set it alight and therefore having fire retardant material is a good idea. If you are using a canopy that doesn’t have this layer of protection then you just need to make sure that any cooking or and campfires are done well away from your canopy. This isn’t often an issue but you don’t want to be taking any chances. 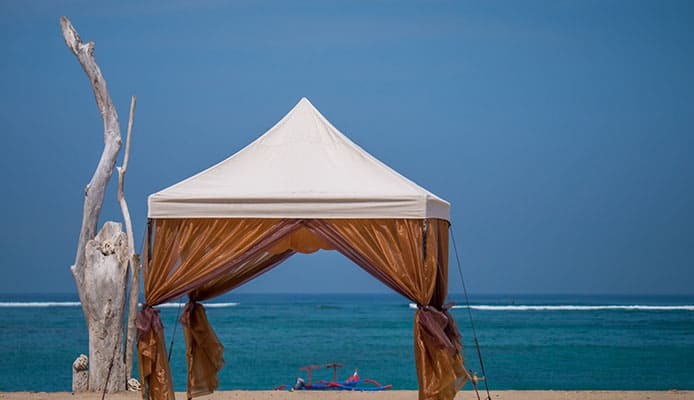 If you are getting a traditional canopy then it is going to have ribs on the top of it just like a beach umbrella. This not only maintains the internal structure of the canopy but it also means that any rain is going to be able to run off it. In terms of the stability and structure of these ribs, they need to be made out of a high-quality metal such as steel or aluminum that is going to be both lightweight and durable. This will keep it portable but will also ensure that it lasts for many years. The ribs also need to keep the material taught to it. Like an umbrella, this will ensure that no water sits in the canopy and gives you a big splash when you are least expecting it. High-quality ribs will ensure that it doesn’t happen. While it is never going to be the most important aspect of buying a canopy, having the ability to choose your own color is something that most people like to be able to do. There are plenty of products that offer a range of color options. This isn’t going to be much of an issue as far as importance is concerned, except for the fact that darker colors will retain more heat but this isn’t really going to be an issue for a canopy. There are other reasons why different colors may come in useful though. If you are on a beach with a lot of people having a canopy, having a unique color or design might make it easier to find when you go back to it, transversely, if you wanted to double up your canopy for camping then a darker color is less likely to attract insects. Going to the beach is meant to be fun or relaxing. The last thing that you want to do is try and solve the puzzle of having to set-up a product that is very difficult and takes you far too long. Due to this, the installation time is going to need to be minimized. This is where tarp canopies can have an advantage as their simple design means that you can be set-up in no time at all. For those that don’t want this time of canopy, thankfully there are a few gear designs out there with traditional types. A lot of these products are simply able to fold out to give you the canopy pace you need. This means that it is only going to take a matter of minutes and can often be set-up by one person. 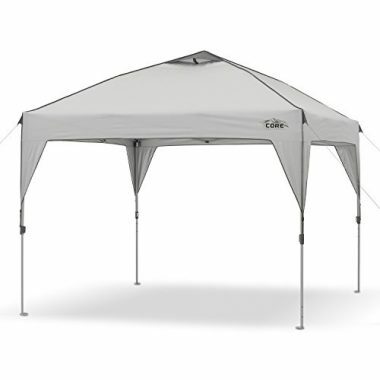 If this is important to you, make sure you look out for canopies that are easy to set-up. It’s no secret that it can get hot at the beach and the air can be stifling if it’s not allowed to circulate. Most canopies have open sides which means that the air is able to flow through but hot air can still get caught up in there. Another way to be able to deal with this is to have a double canopy, this will allow air to flow through it so that it is able to circulate and also so that hot air doesn’t sit in your canopy. This is going to be less important if you have a tarp-style canopy. The weight isn’t going to be a huge issue when it comes to your canopy but you still want to be able to take it from one place to another. If it’s too heavy and you have to park far away from your beach spot, then this could be a huge negative. Having a decent amount of weight in your canopy can be a good thing as it will be more stable in the ground but there are also lightweight canopies that can be securely fitted into the ground, therefore nullifying this advantage. The weight isn’t something that you should take for granted as there are canopies out there which to weigh a significant amount. It’s worth checking this before you buy to make sure that it is something that is going to be portable enough. Side walls are a rare feature when it comes to canopies as most of them have an open design on all four sides. They can be good for a number of different reasons though and it’s a good idea to know what the conditions are like on the beaches you will be traveling too. If it is often windy then these side walls often can give you a good level of protection from the wind and act as a windbreak. This will allow you to relax in more comfort and allow you to read in peace or not have the chill that can come from wind. If you are on a beach where the sun can become quite low in the sky, a sidewall can offer you protection from the sun’s rays when it dips below the coverage that the canopy roof can provide. This is a useful feature for many but an unneeded extra for others, depending on your circumstances. Whether you have a beach canopy that is particularly light or heavy, they are still going to take up a decent amount of space and therefore they are going to be challenging to carry. That’s where a carrying case can come in very useful. Even though it’s just there to carry the product, you still want it to be made out of quality material. It is a common problem that carry cases are made cheaply and they can quickly wear and not be able to offer you the support you need. Some cases actually come with wheels to make it even easier to transport, although once you get to the beach it will need to be carried. It seems like a small thing but having a good carry case will make using your beach canopy a lot easier. Before deciding to buy a canopy you need to make sure that it includes everything that you need to get going. Some cheaper products might only have the canopy and the frame as their product, but you could well need more than that. Those extra accessories mainly relate to being able to fix it to the ground. Whether that is stakes or sand pockets, you need to ensure that you won’t be left without. As mentioned previously, you also want to have a carrying case included too. You also want to ensure you are taking all the beach bag essentials too. 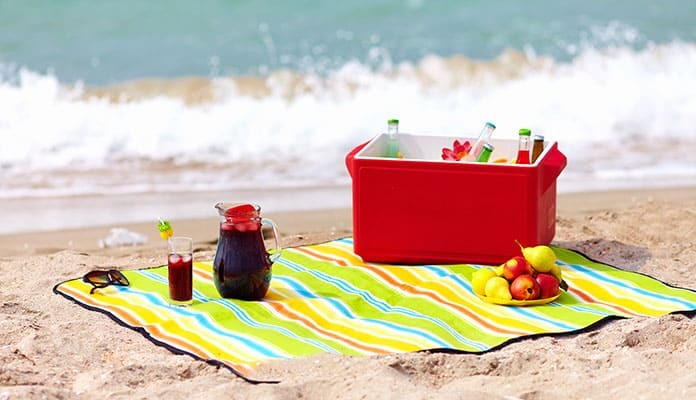 Your beach towel or beach blanket is always going to be essential, and it’s great to be able to relax in a beach chair while you grab an ice cold drink from your beach cooler. One thing that you don’t want to happen when you are out there on the beach is to get sunburnt when you have been under a canopy for most of the day. Sun protection shouldn’t be presumed and it’s a good idea to check that you have it. You are looking for the canopy to have a rating of UPF 50+ as that will give you all the protection you need and is good enough for little children. Without this protection, you could find yourself exposed to those dangerous rays. This protection is all a part of a wider level of safety that you need to ensure when you are at the beach as this general beach safety guide shows and knowing your first aid beach essentials and how to keep your child safe at the beach are also extremely useful things to know. On these types of products, the seam construction is going to be the difference between having a durable product or one that is going to break easily. Taped seams are going to be able to give you that durability you are looking for. It is also an important part of waterproofing too as without sufficient seams, you might find that water can creep in if you find yourself in a rainstorm. All the products we have reviewed have a high level of build quality. 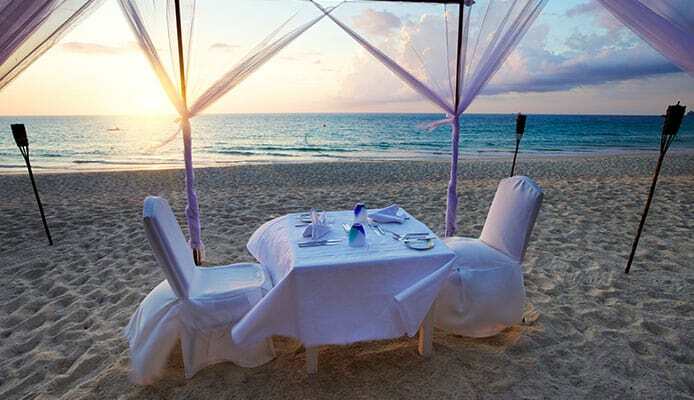 Q: What Is The Difference Between Beach Canopy And Beach Tent? A: They are different in design but they are different in intention too. Beach tents are there to protect you from the sun but also give you privacy. They are a small enclosed space unlike the wide-open nature of the beach canopy. 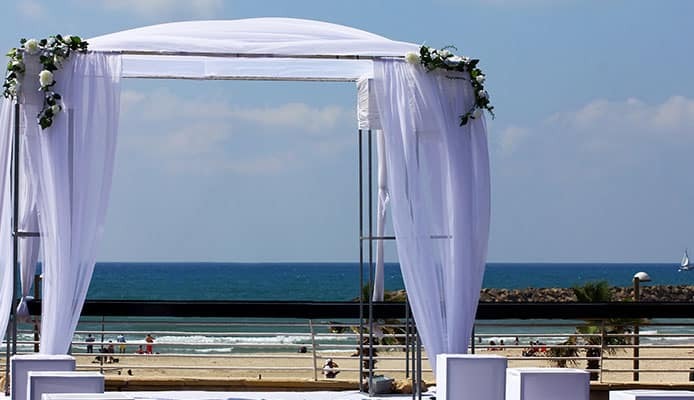 Q: What Are The Benefits Of Choosing A Beach Canopy? A: A beach canopy is going to let you cool off when the heat of the sun is getting too much. 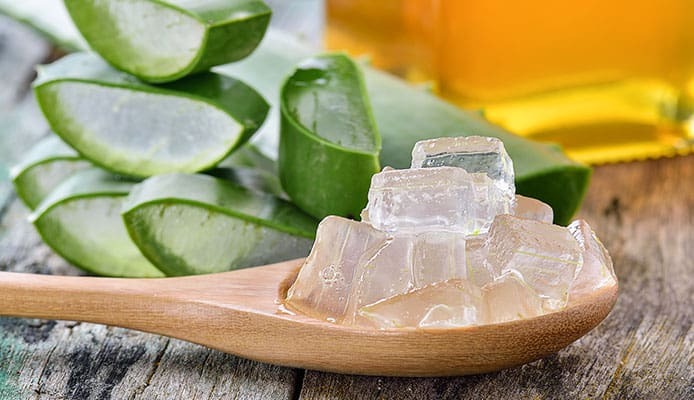 It is also going to be able to protect your skin and give you a place to relax. The canopy can also act as a base for all your friends and family. Q: How Important Are Maintenance And Warranty? A: You want to make sure that your canopy is going to last for a long time and treating it correctly is going to be a big part of that. Having a warranty can also give you peace of mind but you want to make sure that it is covering everything that you want. Having a beach canopy can be an important part of heading out to the beach. Despite everyone loving the sun, everyone knows that it can be dangerous and you don’t want to be out in it for too long. There are also many other reasons that a beach canopy can be a great idea such as keeping children out of the sun completely. In order to choose the best product for you, it’s vital to consider all the key features we have mentioned here. The most important one is going to be size as getting one too small can leave you exposed and unable to cover everyone correctly. After that, the other features have to match your needs too. The type is going to matter and aspects such as the wind protection, ease of set-up, side walls and weight are going to vary in importance depending on the beach you are going to be on and the type of climate in your area. There are many fun things to do at the beach but you can’t be reckless with your skin and sometimes having a break and reapplying that sunscreen is the best idea. It could also be that you aren’t interested in being out under those rays and instead just want to relax on your beach towel.